What was it Like To Be a Horsecar Driver? According to Mr. David E. Huston, 871 Neil Ave, Columbus, Ohio it was very hard work. Mr. Huston was highlighted in a newspaper article in 1948. The occasion was the last run of the last streetcar line in Columbus that happens to be the Neil Ave line, the same street on which Mr. Huston lived. When the last Main-Neil Streetcar rumbles on its final run at 12:20 a.m. Sunday, an 83-year-old former operator of a horse-drawn street car will stand by in his Neil Av home to salute it. As a youth of 16, fresh from the hills near Jackson, Ohio, David E. Huston, 871 Neil Ave, started in 1882 as the driver of a horse-drawn car in High St. His memories of that era are both vivid and revealing. "I was so green the grass was sticking out of my mouth," he recalled on Friday. "I went to work for $1.25 a day. I left the Chittenden Av car barns at 6:20 a.m. every day and quit work at 11 p.m. That was 16 hours and 20 minutes a day except on Sunday. On Sundays we got one morning and one afternoon trip off and had to spend that washing our cars." Long hours weren't Huston's only source of grief. There were other matters such as food, traffic accidents . . . and fights. The food problem was pretty bad he remembers. "I paid $3.50 a week for room and board and lived over the car barns. My landlady would wait until five minutes before I had to report for work before she awakened me I had time to eat only what I could grab. That means the landlady saved on her food bill"
Well, traffic was one of three things which led to his dismissal three times in one day, his re-employment three times the same day, and finally his resignation the same day. "I was driving by the Park Hotel at Goodale St when an Express Co. driver backed around and I ran over his horse. When I got to the end of the line, there was the superintendent of transportation waiting for me to tell me I was fired." "But right away he hired me again. Then later in the day he fired me again for trotting the horses over the railroad tracks. You had to walk them. But again he rehired me. "Then that night I got in a fight. Another driver who was dismissed told my brother I said something I didn't say. We tangled and the superintendent was there. He told me I was fired. Then he said I was the cussedest man he'd ever seen and to go back to work and behave myself. "That was too much, I told him three dismissals in one day were just too many and I was quitting after four months on the job." Huston's run in High St between the Chittenden Av barns and the last stop in S. High St, known as City Park." He made 11 round trips a day, each trip taking 1 hour and 30 minutes. Other than the $3.50 he spent for board and room, Huston turned his weekly pay over to his widowed mother for her support and that of four younger children in the family. Few of the present buildings in High St were standing at the time Huston accepted his job. The only paving on Columbus Streets was between the streetcar tracks and in West Broad St from High St to the old wooden bridge. After Huston resigned his job, he went to work for a chair manufacturing firm at an increased wage of $1.50 a day. Later he worked for several buggy concerns. 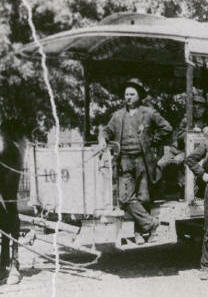 After suffering two severe hand injuries in industrial accidents, he and his wife opened a grocery store in Goodale St. In this project he lost $600 of his $1200 saving because "people were honest but just didn't have money to pay their bills." With the remaining $600, the former horse-drawn streetcar operator entered the real estate business. In this he was highly successful and remained until his retirement about 25 years ago. His original firm, the Huston Real Estate Co., is now managed by a grandson. During the first year of the late James A. Thomas' first administration, Huston served as superintendent of the electric light plant. The next year he helped reorganize the building department and later served briefly as a building inspector. For nearly 40 years he was director and vice president of the Parks Federal Savings and Loan Co., retiring as vice president only a few years ago. He is a member of the York Lodge of Masons, being the second member to be initiated after the lodge was founded by 12 charter members. A past master of the lodge, he entertained all past masters of the lodge on his birthday each year until three years ago when illness of his wife necessitated abandonment of the tradition. Mr. Huston observed his 83rd birthday Wednesday. Married more than 56 years Mr. and Mrs. Huston have one son, four grandchildren, and eight great grandchildren. Their daughter, Mrs. Elsa Dillahunt died last year. "When a family can go 56 years without a death in the immediate family, we should open our hearts and say to God that He has been good to us."